The Model AD-1 is an Audio Distribution System which distributes high quality audio from a central source to as many as twenty remote locations. It is a truly balanced and isolated system which offers a high rate of rejection to hum and noise, and prevents leakage of audio signals between remote locations. 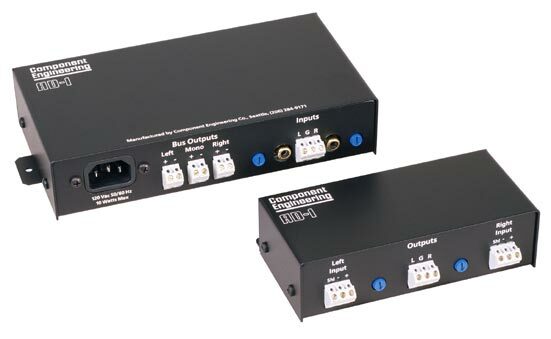 This is accomplished by the use of one distribution amplifier (transmitter) with active balanced stereo and monaural outputs which can feed up to twenty individual receivers. Any line level audio source can be connected to the AD-1 transmitter input. Level controls are provided. The AD-1 receivers process the audio through specially designed transformers which preserve the integrity of the balanced lines. Output level controls are provided on each receiver. The AD-1 Transmitter is designed to feed all receivers in parallel, thus the wiring can be looped, or "daisy-chained" from one receiver to the next and so on. Two conductor shielded cable per channel is recommended. The transmitter and receivers can be surface mounted by tabs located at each end, or to an optional one unit rack panel. The AD-1 receivers can also be attached to our MS-100 Monitor Amplifier rear panel or the rear flanges on Dolby Cinema Processors.